Why spend another New Year’s Eve in an over-priced underwhelming club (insert plastic noisemakers and 2016 sunglasses) when you can party in Pittsburgh’s brand new ultra-hip Ace Hotel? Be among the first to get down on the dance floor at one of Pittsburgh’s most-talked about new developments when the Ace welcomes revelers to its second floor ballroom to christen its stylish new digs and the new year ahead. Underscoring the hotel’s mission to create a space with a Pittsburgh vibe and regional roots—both in terms of design and programming—the national boutique chain, which is located in East Liberty’s 100-year-old former YMCA building on S. Whitfield St., has teamed up with local cultural producers to host the not-to-miss NYE bash. 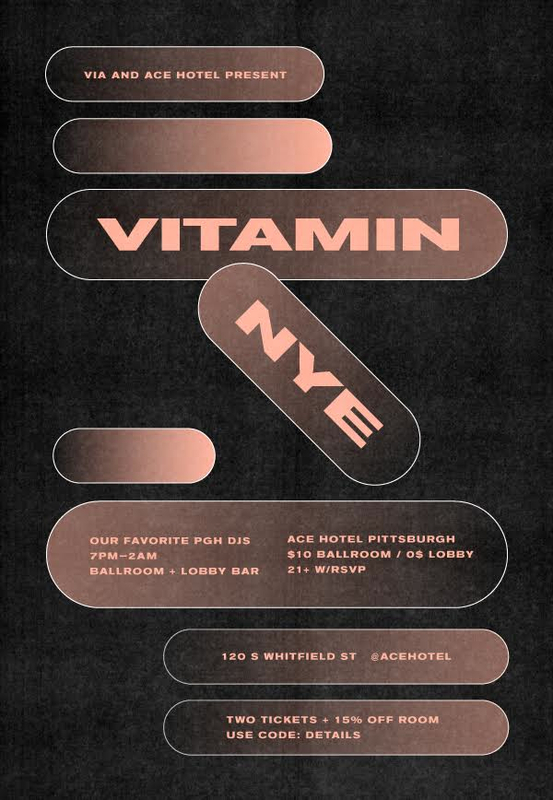 Dubbed Vitamin NYE, the party brings together the minds behind Pittsburgh’s innovative VIA Music & New Media Festival, along with a slew of local DJs, for Ace’s first party it its new home. Sharing the sounds of a new era will be DJs representing a wide range of musical styles from local party crews, including Pittsburgh Track Authority, Chocolate Boombox (Anthony Susan, Chris Schubert and Harry Lurker), Pete Spynda (Pandemic), Clark Price (Honcho), Boo Lean (VIA), slowdanger and Kelly Carter (Ace Hotel). 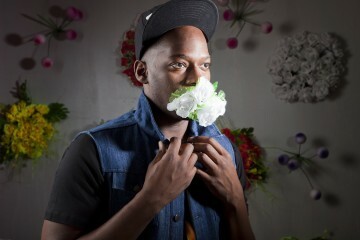 Since we all need a jolt of color and light therapy during the gloomy days of winter, this party’s got you covered. Animating the Ace’s minimalist modern walls and bathing the scene in an optical aura will be video and visual artists Ben Tabas, Julie Mallis and EngineHouse. Using VIA’s “Augmentats” photo booth app, which will feature new graphics designed by artist and programmer Claire Hentschker, attendees can also digitally document their adventures at the ACE. Light bites from Ace’s brand new Whitfield restaurant will be available for purchase and served in the ballroom. Stop by before, during or after any other NYE plans you have—or make an entire night of it and sleep it all off inside one of Ace’s newly designed rooms—as this party runs from 7 p.m. to 2 a.m. The very reasonable cover charge for admission to the ballroom is $10, and as an added bonus, patrons can join the festivities in the Ace lobby for free. 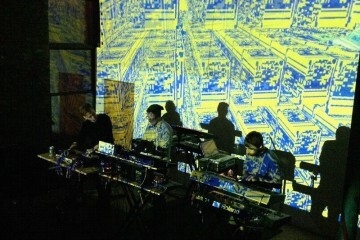 Vitamin NYE is open to ages 21 and up. Making a night of it? Use the code “DETAILS” to receive 15% off rooms and two tickets at check-in. Attendees arriving before 10 p.m. will be entered into a lottery for the chance to win a one-night stay on NYE.